Celebrate the Year of the Ox. This is a time to reap what we have sown. It's a year when diligence pays off. Celebrate with the Ox of Happiness and reap what your diligent efforts will sow. The Happy Ox will show you how to celebrate the Year of the Ox properly. Spin two to five of this symbol and you'll win up to 8888 times your original line bet. He also substitutes for all other symbols, excluding the scatters, to help you create more winning combinations. 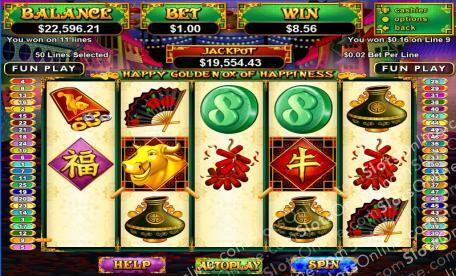 Two or more Chinese Symbols will see a win worth up to 2888 times your line bet. And since this is a celebration, you'll also find symbols such as Chinese dragons, lanterns, firecrackers, fans and pottery to help the growth of your account balance. There are also a couple of bonuses hidden amongst the board of the Happy Ox. If you activate these bonuses, you'll be rewarded with everything from respins to free games! Celebrate the Year of the Ox and reap the financial benefits of this time of growth. The Year of the Ox Chinese Symbol acts as the scatter. Spin three to five of these anyhwere on the board and your total bet will be multiplied respectively. If you spin three or more, you will be rewarded with eight free games. All prizes are tripled during these free games. You can win respins during free games. If this is the case, prizes are multiplied by three in the first spin, by four in the second respin, by five in the third spin and so on. The Golden Happy Ox will substitute for all other symbols on the board. Five of these symbols will give you 8888 times your original line bet. If you can spin him on reels 1 and 5, you will trigger a respin feature. Reels 1 and 5 are held while the other respin up to eight times. Prizes during the repsins are mulitplied by one for the first spin, two for the second spin and so on.